Can a Squirrel become a teacher ? Building LMS Tools for SPIP ! The ever expanding Internet was a major revolution for human communications ; we can find almost anything on every kind of subjects, exchange videos, phonograms, images, text, databases...and of course, the learning of trades and scientific knowledge met a remarkable evolution on account of that. It’s inconceivable nowadays to have a school or University that doesn’t use the Internet as an indispensable tool. For NGO’s like OSI, using a CMS (Content Management System) like SPIP brings great advantages - to share information, but also to write on-line collaborative articles, where everyone contributes and develops its knowledge - sharing information, photos, experiences and know-how. 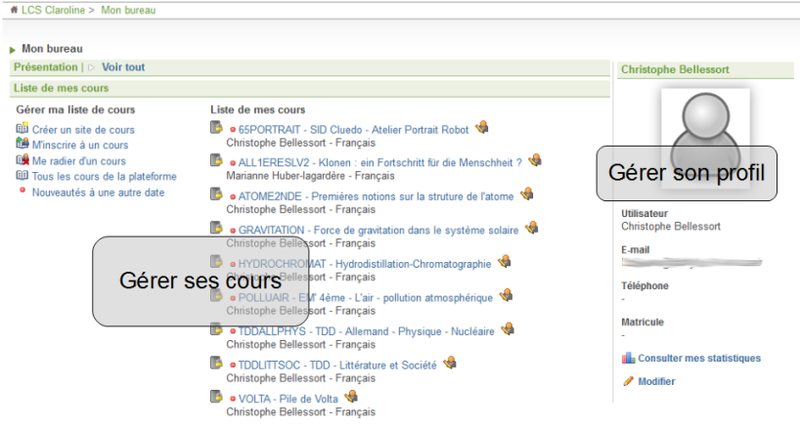 Claroline : an example of the students interface. LMS (Learning Management System) is software designed for learning and knowledge management - that is, software which provides on-line classes and allows the accompanying of students during their training - with plenty of additional tools and plug-ins, such as quizzes, exercises, polls, file archives, etc. We can find many applications of this type, which can be downloaded and installed on servers - most of this software is designed to run as an interactive website and database, that everyone can use over a simple browser. There are many LMS available out there : Claroline, Moodle, Atutor, Dokeos, Anaxagora, Chamilo, Ganesha...with many similar functions, some a bit different, and written for many languages and software platforms. Among the most popular and most distributed are Moodle (mainly popular with anglo-american users) or Claroline (more commonly used in French speaking countries). Both of them are FLOSS (Free Libre Open Source Software), distributed with a GPL License. The source code is available to the users and can be modified to improve the software and suit their needs - and they can contribute to its improvement and evolution - like SPIP, which is also Free-Libre Software. So ; can SPIP be used as an LMS, if we install the right tools and plugins ? Before you continue to read, watch this video...for inspiration ! Composing exercises, which can include audiovisual data for consultation (for example, a video of a chemical reaction, to identify the components via text or quiz ; images or sounds of animals or plants to identify and classify them, etc). Publication of calendars, public or private, for each class or student, with the calendar of exercises, classes, evaluations, etc. Structuring of calendars with specific tasks and deadlines. 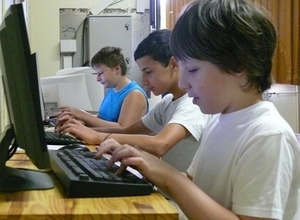 Publication of information by e-mail or internal messaging (for example, a teacher can communicate with its students, by selecting classes or work groups defined by him or an administrator of the website, before sending a message). So, here’s our challenge : how can we gather all these features and make them available on SPIP ? As a CMS, SPIP already has a good number of tools to achieve most of these tasks. And, of course, we can use and adapt the many plugins available for SPIP, created by its very active community. SPIP is already capable of doing this. And in a collaborative fashion ; each article, with different permission levels, can be edited by several people and published after final approval from a top-level user. - Creating and managing users with different permissions : student, teacher, administrator. Creating on-line courses and classes with different access levels and permissions, for each student enrolled and registered on the website. This plugin gives you the capability to protect and restrict access to certain sections only to authenticated and authorized visitors. If a visitor is not identified or is not allowed, then the entire section (which includes the sub-categories, articles, links ...) will not be visible to the visitor. Allows you to tweak permissions (add your own !). Some people find the permissions of SPIP too rigid : for example, only the editors that you trust (and can be promoted to « Directors ») are allowed to change the published articles. Since version 1.9.2, SPIP provides an API (application programming interface) that centralizes all the different and varied authorization checks. The « Authority » plugin is the first to use this API to provide other modes of hierarchical functions and editing. Restrict access to Sections by groups of authors. One of the common needs when a site is managed by SPIP is to restrict access to certain sections so that they are accessible only to certain users. To allow complete management in an easy and ergonomic fashion, it is essential that the authorized users are managed by groups. So, for you to have sections (courses) specifically assigned to user groups (classes), this may be the tool that most resembles a common LMS function. It is always possible to add multiple document formats on SPIP - and even embedded video and audio files. All SPIP articles can include digital files, like pdf, doc, odt, ods, xls, jpg, etc., added during the writing and publishing. Has added the time of writing. And even convert them into pdf. SPIP is not able, for the moment, to have complex questionnaires, but if anyone in the community wants to develop these tools...that will be most welcome ! Management and administration of editable forms. This plugin also allows the publication of opinion polls and surveys, collecting responses in the database and allowing the download in .csv format. This plugin allows you to display text fields with questionnaires, email, multiple choice (complete or not). The results can be public or private and can be exported - which is very convenient to compose exercises for multiple students. The Forms plugin allows the creation of forms with different types of questions and even the ability to add files. In addition, the results of the form are accessible through the private interface or by receiving the results by email and exporting them to a .csv. Read the documentation. A form generator easily configurable for non-technical folk and easily expansible for developers. The e-learning plugin for SPIP tries to implement some basic LMS functions ; read the complete description. Playing sound and video embedded directly on the articles ? Yes, it’s possible. Certification and competences : how can we make sure that students actually master the results of their learning process ? Manage visitor and user statistics, student monitoring, etc.. This plugin has the ability to monitor how much time a user opens an article and is working on it, how often downloads documentation archived on SPIP, etc.. This way, a teacher can tell if a student has already read or updated an article, downloaded a required document, and so on. Download counter for SPIP documents. You want to know if your students download the exercises and texts that require reading ? This plugin might help you. - Creating public and private forums for discussions. Management of private and public forums on SPIP. The learning process is much more comfortable and stimulating if we cooperate, debate and share our knowledge ! The forums are an invaluable learning tool for the entire classroom. - Publication of calendars, public or private, for each class or student, with the calendar of exercises, classes, evaluations, etc. The GCalendar plugin provides an interface for a SPIP site with Google Calendar. As impressive as the Agenda 2 plugin is for SPIP, some editors refuse to use it. This plugin aims to facilitate the work of publishers offering them the possibility to add events from gadgets available on iGoogle or vista. This plugin provides a new « editorial object » event. It allows to create events in the same way that you can create articles or brief news. - Publication of information by e-mail or internal messaging (for example, a teacher can communicate with its students, by selecting classes or work groups defined by him or an administrator of the website, before sending a message). Announcements for the private messaging space. Through announcements, site administrators can communicate information to all editors at once. SPIP offers a generic function to send an email, such as « envoyer_mail ». It is fairly easy to use, but that may seem limited when you want to configure more complex options : sending SMTP, adding attachments, etc. The Factor plugin proposes to integrate the PHPMailer library to SPIP in a proper way. This plugin adds some contacts managing features. It distinguishes organizations from individuals, conserving all the attributes of the SPIP authors. In conjunction with the plugin Coordinates, it allows you to extend both the unit fields (name, date of birth ...) and multiple fields (phone numbers, email addresses ...), which is very useful for managing classes and enrolled students. If you have more suggestions for plugins and alternatives - add your own contribution ! What do we seek at this moment at OSI ? A plugin that allows you to convert SPIP articles directly into slide presentations (Microsoft Powerpoint - ppt, Open Document Presentation - odp ...). If you know how to do it ... it will be very welcome ! Many plugins for SPIP, for several versions, to be able to do... almost everything ! Downloads, plugins, contributes...we can find many useful add-ons for the SPIP universe, on this website. A demo page for Moodle, one of the most popular LMS. A demo for Claroline, the widely known French-speaking LMS. A comparison between the possibilities of Moodle, Claroline and Atutor, three different LMS (Learning Managament System). Daphne Koller is enticing top universities to put their most intriguing courses online for free — not just as a service, but as a way to research how people learn. With Coursera (co founded by Andrew Ng), each keystroke, quiz, peer-to-peer discussion and self-graded assignment builds an unprecedented pool of data on how knowledge is processed. OpenupEd is the first MOOCs initiative which goes Europe-wide, with the support of the European Commission. At the start around 40 courses, covering a wide variety of subjects, are available, in 12 different languages. OpenupEd has been initiated and is coordinated by the European Association of Distance Teaching Universities (EADTU) and mostly involves open universities. The 11 launch partners are based in France, Italy, Lithuania, the Netherlands, Portugal, Slovakia, Spain, and the UK, and outside the EU in Russia, Turkey and Israel. 20 tips and resources for using learning technology in higher education. MOOC - « Massive Open Online Course » are on-line courses that many universities already use as a complementary resource to their regular classes. LMS software plays a very important role in this context. MOOCs : a massive opportunity for higher education, or digital hype ? Not everyone agrees about the benefits of Moocs. In fact, its limitations are well known. This article discusses some of its problems and limitations. A more optimistic view of the prospects of on-line teaching and learning. A very critical article on the mechanisms of inequality brought on by MOOCs, and its consequences on the access to a quality education. An interesting list of MOOCs available on the web.